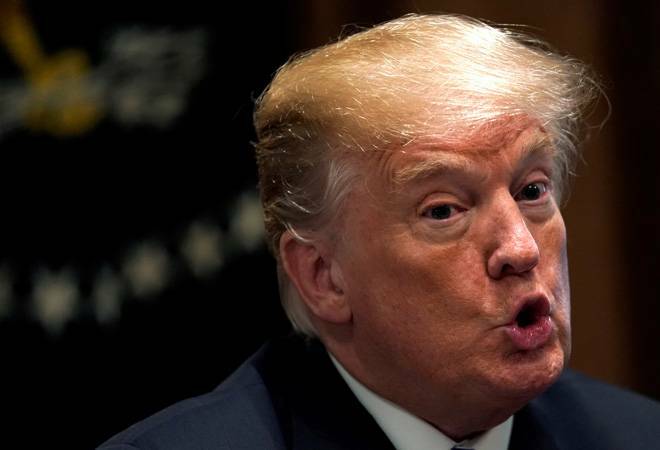 US President Donald Trump has said it several times before, and he has just repeated it again: India, in his view, is among the countries imposing as high as 100 per cent tariffs on American products. The only difference is that he earlier used the Harley-Davidson brand to lash out against India's high import duties but this time there was no mention of the iconic motorcycle manufacturer, currently in his bad books. The timing of the latest potshot has also raised eyebrows since it comes just ahead of next week's maiden 2+2 dialogue between the US and India. External Affairs Minister Sushma Swaraj and Defence Minister Nirmala Sitharaman will be in the US for talks with their American counterparts Secretary of State Mike Pompeo and Defence Secretary James Mattis. "We have countries where, as an example, India, they charge up as much as 100 per cent tariff. We want the tariffs removed," Trump told reporters at the White House, responding to a question on his recent decisions to impose tariffs on import of foreign products. Trump defended his moves by arguing that this is in retaliation to the imbalance of trade that the US has with major trading partners including China, the European Union and India. "What I would like to do, [is] what I offered at the G7 [Summit]. You remember, I said let's drop all tariffs and all barriers," he said, recollecting his conversation with G-7 leaders in Canada recently. "Is everybody OK with that? And nobody said yes. I said wait a minute folks, you're complaining. No tariffs and no barriers, you're on your own, let's do it. And it was like they couldn't leave the room fast enough," he added. According to him, tariffs are a good negotiation tool. "Other countries are negotiating with US. Without tariffs, you could never do that," said Trump, adding, "The bottom line is, we have charged a very substantial tax to some people. They are coming back to negotiate. And, frankly, if they don't negotiate, I'm okay with that because I'd rather get the tax." He further claimed that his policy to impose import tariffs on selected items is yielding results. As an example he said that tariffs helped to revive the steel industry which was at the bottom. "Just remember, we're the bank. We're the bank that everybody wants to steal from and plunder and can't be that way anymore. We lost $500 billion last year with China. We lost $151 billion with the European Union, which puts up great barriers so that our farmers can't trade. We can't send farm products in for the most part. It's very hard to send cars in." Here's what he had to say about Chinese tariffs: "When they make a car in China, and they send it here, we charge them 2.5 per cent. So we get 2.5 per cent; China gets 25 per cent. That's not fair. That's not free. That's just stupid." Incidentally, according to the World Trade Organisation, the average tariff rate on imported goods in China, Trump's main target, was 9.9 per cent in 2016 compared to 13.5 per cent for India and 3.4 per cent in the US. That makes India one of the most protected major economies, so we are likely to keep hearing more Trump-style jibes and threats. But experts in Washington hope that the upcoming 2+2 dialogue will help change the current narrative surrounding the bilateral relationship. Trade friction, after all, isn't conducive to bilateral trade - pegged at about $115 billion in 2016, up from $20 billion in 2001.